Suspect Arrested for June 20 Bank Robbery. 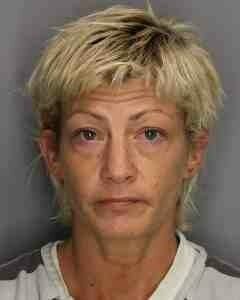 The Washington County Sheriff’s Office has charged Christi Diana Slade, 44, for the June 20 robbery of the M&T Bank on Pennsylvania Ave.
Slade was arrested on June 22, 2017, in Columbia County, New York with the help of the Columbia County Sheriff’s Department. The Washington County Sheriff’s Office is currently investigating a bank robbery. On June 20, 2017 at approximately 4:30 PM, a female suspect entered the M&T Bank, 13409 Pennsylvania Ave, and passed a note to the teller demanding money. After receiving an undisclosed amount of money the female fled the area in a light blue Dodge Caravan with New York registration. The suspect is a white female, approximately 5’4″, with a thin build. Anyone with information on the females identity is asked to contact the Sheriff’s Office at 240-313-2171 or if you see the vehicle call 9-1-1. Sheriff’s Office is still seeking information on suspect’s identity. 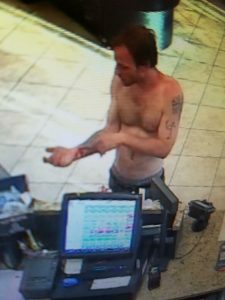 The Sheriff’s Office has obtained additional photographs of the suspect from the June 19 Burglary of Rosewood Liquors and vehicle theft incident. Anyone with information on the suspect’s identity is asked to contact the Sheriff’s Office at 240-313-2170. On June 19, 2017 at approximately 7:13 AM, Deputies responded to Rosewood Liquors, 11205 John F Kennedy Drive, for an alarm. Upon arrival Deputies found the glass to the front door of the business had been broken out. As Deputies investigated the incident, at approximately 7:58 AM, a caller reported that their motor vehicle had been stolen. The caller was able to give a description of the suspect and it was determined to be the same suspect as the burglary to the Liquor Store. The stolen motor vehicle, a 2004 Oldsmobile Alero, was later located, parked, in downtown Hagerstown. The suspect was not with the vehicle. Law Enforcement searched the area for the suspect but was unable to locate him. The suspect is a white male, 20-30 years of age, with blond hair, facial hair and wearing long shorts. The suspect sustained a laceration to his right forearm. Anyone with information on the suspect’s identity is asked to contact the Washington County Sheriff’s Office, 240-313-2171 or if you see the suspect call 9-1-1. Sheriff’s Office seeking information on runaway juvenile. The Washington County Sheriff’s Office is seeking information on a runaway juvenile. Ricky V Summerville, 17, was last seen on June 17, 2017 at approximately 10:00 AM, after being dropped off for a home visit on North Ellswood Street in Baltimore, MD. Summerville is a black male, 5’3”, 124 lbs with brown eyes and short brown hair. Anyone with information on his location is asked to contact the Sheriff’s Office at 240-313-2170. No picture was available to be given to the Sheriff’s Office. Sheriff’s Office is searching for runaway juvenile. On Friday, June 23rd, 2017, Washington County Sheriff’s Office Deputies responded to the area of Fair Oaks Court, Hagerstown, Maryland for a report of a missing juvenile. Deputies received information at the scene that Adriana Jackelin Menjivar age 13 had run away from her residence between 23:30 hours on Thursday, June 22nd, 2017 and 01:30 hours on Friday, June 23rd, 2017. Adriana Menjivar was described as being 5’0”, 180 lbs., brown eyes and black shoulder length hair. If any information is obtained, please contact the Washington County Sheriff’s Office at 240-313-2170. 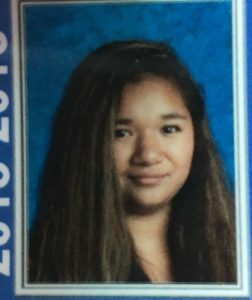 The Washington County Sheriff’s Office is searching for a juvenile who ran away from Oak Hill Children’s House in Clear Spring, MD. 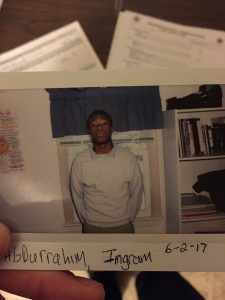 Abdur Rahim Ingram, 16, was last seen on June 18, 2017, at approximately 11:30 PM. Ingram is a black male, 5’9”, 140 lbs with brown hair and brown eyes. Anyone with information on Ingram’s location is asked to contact the Sheriff’s Office at 240-313-2170. The Washington County Sheriff’s Office is reminding citizens not to leave keys in their motor vehicles. Since May 1, 2017, 9 vehicles have been reported stolen to the Sheriff’s Office that had their keys in them! During that time frame, the Sheriff’s Office received 53 reports of thefts from motor vehicles, 38 of those vehicle were confirmed to have been left unlocked. These incidents have happened throughout Washington County. Keep in mind that criminals will choose an easy target. By following the steps below you can make it difficult for a criminal to steal your car or steal from your car. DO NOT leave your keys in the vehicle! Close all windows and lock all doors, even if you only leave your car for a moment. Never leave your vehicle running unattended. Keep the interior of your car “showroom clean” with nothing in it. If you must store valuables in your car, hide them or place them in the trunk before you arrive at your destination in the event that a criminal is casing the area. Never leave bags, purses, wallets, briefcases, laptops, cell phones and loose change in plain view. Hide chargers and accessories that indicate a GPS, mobile phone or other device may be stashed in your vehicle. Remove garage door openers, key fobs, and house, work and car keys so that a criminal cannot steal your car or commit burglary. Improve visibility where your car is parked. If you park on the street, choose a well-lit, open space even if it means adding additional exterior lighting. Trim back trees or bushes that block the view of your vehicle from your home. Avoid parking near anything that limits visibility such as wooded areas, dumpsters, large vans or trucks. Be observant when you exit or enter your parked vehicle, stop and take a look around the area. Report any suspicious activity to the police.